Dave Navarro and Courtney Love are pretty good friends as you can see by this kiss they once shared on stage. After Kurt died, Courtney gave away many of Cobain’s belongings to his friends and fans. She gave away Kurt’s Tom Peterson watch to Kat Bjelland of Babes In Toyland. She gave away Kurt’s Fender Jag-Stang Guitar to Peter Buck of R.E.M. 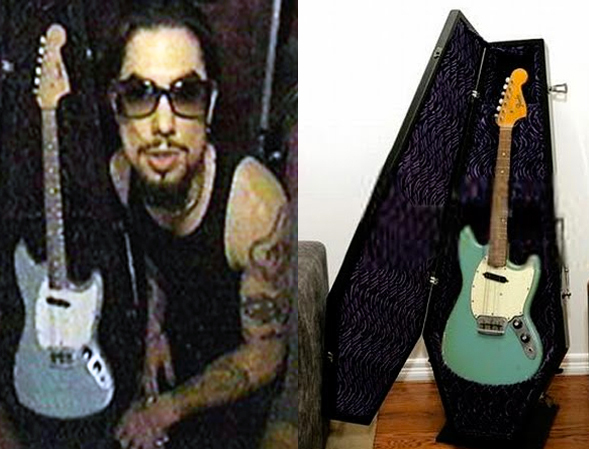 She also gave Navarro this Daphne Blue Fender Musicmaster guitar that used to belong to Kurt. Cobain did not use this guitar much and Navarro as well has not used this guitar live or on any known recordings. Navarro has stated that the guitar is on display at his home and is not at all interested in selling it. He did say that if Frances Bean Cobain wanted it back, he would give it to her. Classy guy.